The garlic press is a great tool to crush fresh garlic. There is nothing like the flavor of freshly crushed garlic! We have found that this garlic press is extremely easy to use and clean. The small plastic “part” is used to clean the holes in the bottom of the garlic press. 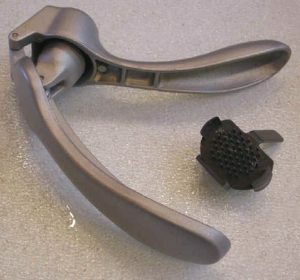 In the photo to the left, a clove of garlic has been placed in the bowl or cylinder of the garlic press; and when the two handles of the garlic press are squeezed together, the plunger forces the garlic through little holes in the bottom of the bowl (photo right). When we are finished crushing the garlic, we use a knife to cut off any garlic clinging to the holes, and then use the plastic hole cleaner to remove the remaining garlic that we also put into the food we are preparing.